I’ve read little bits about the theory of syncing the camera to a pulsed led but nothing definitive. Liking the new forum by the way! Yes this is doable although you would actually sync your LED pulse to the camera VSync signal. doable is good! That’s what I meant - sync the LED to the camera. VSYNC - that seems to be the key word - also found info HERE. Someone else mentions an Arduino too - great minds think alike! You might want to experiment with upcoming CL-Eye Multicam API. In there we will expose the LED control so that you can use this to control your external light source. And yea, using en external micro-controller such as Arduino might help in precise control of the lights. 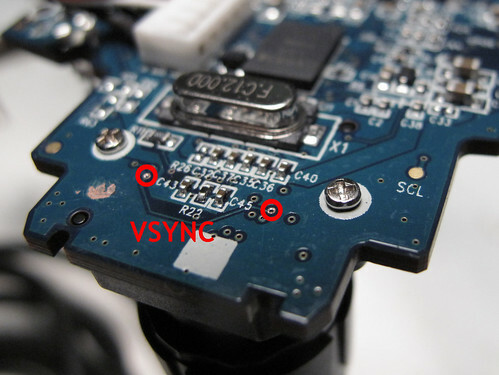 I have done some experiments with VSYNC pin, and it really works! camera gets values about 200 and higher. without any need for hardware modifications - it uses camera built-in red diode. Attached frame which should be all dark (the diodes are off). It happens only with high exposure values. Got to check that out on my full hd camera settings.